The River Lickle is one of the less well known rivers of the Lake District, flowing south-west through quiet countryside from Walna Scar into the Duddon west of Broughton-in-Furness. Thousands probably cross it every day on the A595 without realising the river is even there (me included! ), as it comes just to the east of Duddon Bridge with its traffic lights and the turn to Ulpha. The very top reaches of the river can be closely followed on footpaths on both banks. Further down the stretch between Broughton Mill and Croglinhurst has a path, but otherwise the only access is on paths that cross the river. 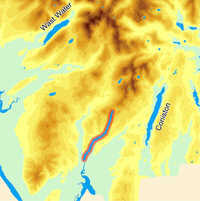 The river lies on something of a dividing line, with high rocky ground to the west (most notably Caw at its northern end) and lower smoother (but still hilly) ground to the east. The Lickle rises in the hills to the south-west of Walna Scar, on the western side of Coniston Water. The Lickle flows south/ south-west alongside a Forestry Commission plantation, then curves to the south-west, passing Broughton Mills before emerging into a slightly wider valley. This valley forms the flat area to the west of Broughton in Furness, and runs into the River Duddon just to the west of Broughton, on the very border of the National Park.